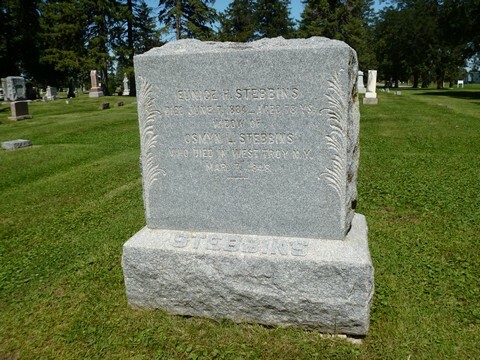 The Stebbins women then turned to helping others. Eunice and two of John's siblings, Helen and Helen Stebbins, became Nurses, caring for wounded soldiers at Jarvis Hospital in Baltimore. Details regarding how long they served have not yet been found, but the Hospital closed at the end of the War, and the trio was living in Osage, Iowa at the time of the 1880 Census. Mother, Eunice, passed away in 1884 and was buried at Osage Cemetery. 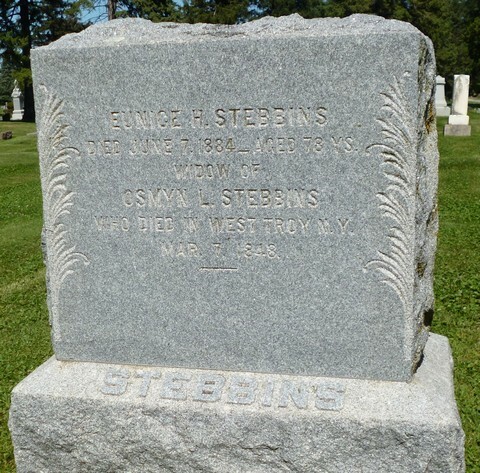 Helen and Julia headed West and settled in Santa Ana, California where they spent their remaining years near a younger sibling, Mary Stebbins Town. Both sisters filed for pension benefits on September 21, 1892. (Nurses were not granted the right to receive pension benefits until August 16, 1892.) Helen died in 1914 followed by Julia in 1918, and both were buried at Fairhaven Memorial Park in Santa, Ana.